Note: This guide is for use with BuddyPress 2.2+. Any public registered post type can be tracked into the activity streams once it has been published. Here are the different options to add the “buddypress-activity” support to a public post type. 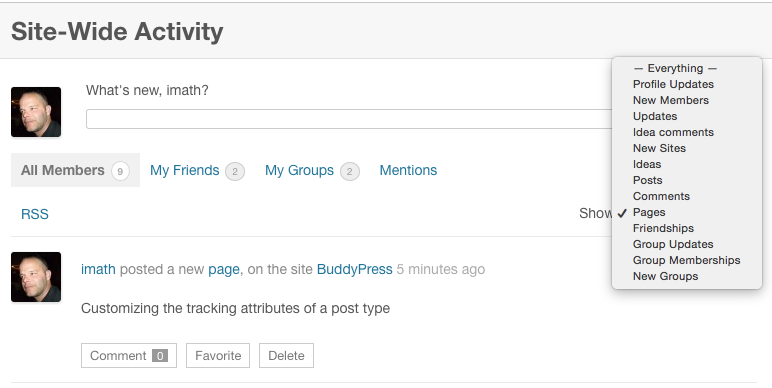 If you activate the Site Tracking component from the BuddyPress component’s Administration screen, the post post type will automatically have the “buddypress-activity” feature enable. Comments about this post type will also generate activities or, if you chose to “allow the activity stream commenting on blog posts” from the BuddyPress settings Administration screen, comments will be synchronized with the activity stream. In this case, BuddyPress will set an activity action using generic activity attributes : the component, the generated activities will be attached to, will be the Activity component; the action type will be the post type’s name prefixed by the mention ‘new_’ (in our example ‘new_page’); the label of the front-end activity dropdown filters will be the name parameter of the ‘labels’ argument of the post type (in our example ‘Pages’); the label of the Activity Administration screens dropdown filters will be __( 'New item published', 'buddypress' ); the action string will be __( '%1$s wrote a new <a href="%2$s">item</a>', 'buddypress' ) where %1$s will be replaced by the member’s link of the post type’s author and %2$s by the url to the post type; the context will be limited to the Activity directory; commenting on generated activities about the post type will be possible if the post type is not supporting comments. // Don't forget to add the 'buddypress-activity' support! Using add_post_type_support() and customizing activity attributes. A string that describes the action description and that is used in the Activity Administration screens as the label of the activity dropdown filters. A string that describes the action label of the activity front-end dropdown filters. An array that describes the Activity stream contexts where the filter should appear. Possible values are ‘activity’, ‘member’, ‘member_groups’, ‘group’. A boolean to allow/disallow comments on the activity items. Defaults to true if the post type does not natively support comments, otherwise false. When registering a post type in WordPress it’s also possible to set the ‘buddypress-activity’ feature using the support parameter of the second argument of the register_post_type() function. Custom activity action strings can be defined within the labels parameter and activity attributes can be set using the parameter ‘bp_activity’. See below for an example of use. Important note: public parameter should be defined and set to true, otherwise the connection between post type and Activity component won’t be established. You can customize the activity action of a Post Type via the register_post_type() example above. If you want to customize the Post Type activity content you can filter bp_before_activity_add_parse_args or bp_after_activity_add_parse_args. Below is an example of code to put into your bp-custom.php file to add the comments tracking feature to the “page” Post Type. Below is an example of code to put into your bp-custom.php file to registyer a “foo” Post Type and directly set the 'buddypress-activity' and 'comments' supports during this registration. Some of you may have used the 'bp_blogs_record_post_post_types' filter to include custom post types to the site tracking having the Blogs component activated. These post types will keep on being included as long as the Blogs component is active. About Post Type comments tracking: if the Blogs component (Site Tracking) is active and if the “Allow activity stream commenting on blog and forum posts” setting is checked, comments about the Post Type will be synchronized with the activity comments about the corresponding Post Type activity.